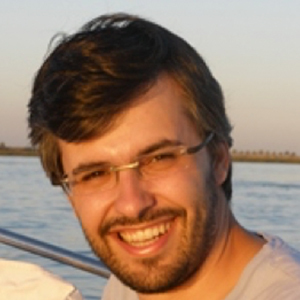 Ricardo Ferreira is the Group Leader of the Spintronics research group at INL and Head of the Nano-Electronics and Nano-Engineering Department from February 2018. He received his PhD in Physics Engineering from Instituto Superior Técnico (IST) in 2008 upon his work on ion beam deposited magnetic tunnel junctions targeting hard disk drive read heads, non‐volatile memories and magnetic field sensor applications. At INL the work of Ricardo has been focused on the production of MTJs using MgO barriers and the development of two high yield and high uniformity fabrication processes on 200mm wafers : a micro‐fabrication process (for the production of devices down to 1μm2) and a nanofabrication process (for the production of devices <50nm). The current research goals include the linearization of full signal MgO MTJs, the production of magnetometers for operation under harsh conditions, the fabrication of magnetic field sensors targeting the detection of pT fields in the 1/f dominated frequency region, the production of devices that explore spin transfer and spin hall effects (nano-oscillators, MRAM cells, other nano-scale devices executing high level functions), the incorporation of perpendicular magnetization materials on MTJs and the monolithic integration of MTJs with MEMS and CMOS devices. Ricardo is engaged in several projects concerning the application of MTJ devices in high TRL Industrial applications, including projects aiming the production of cyber-physical systems as enablers of IIOT and Industry 4.0 ready production systems, as well as space applications. He is co‐author of 80+ peer‐reviews publications and co-inventor in 2 patent applications submitted at INL.